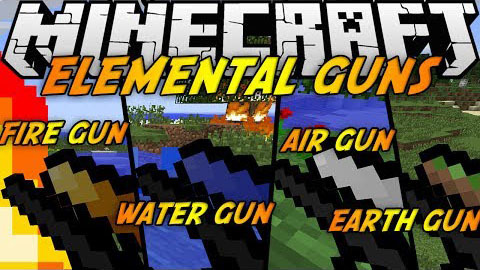 The Elemental Guns mod adds a variety of different guns, each with special abilities based on elements. Each gun is unique, and can do more than just shoot enemies in minecraft. The guns are not only weapons, but useful tools as well! The mod is also multiplayer-compatible, so you can have fun battles with your friends. From starting fires to putting them out, growing trees to making pigs fly, the Elemental Guns mod is fun and useful for every Minecrafter! The recipe for each gun and its canister is shown separately under each guns heading. However, to make a canister, you first need two base ingredients: an Empty Canister and Reinforced Gunpowder. Rapid Shooting, like a Flamethrower. Shoots a cloud of flames. Flames everything they touch on fire. Flames do 3 hearts of damage every half-second (more than lava! ), and set mobs/players on fire. Flames cook most types of food. It’s best to cook food on snow, so that flames get put out when they touch the ground. Not very effective against fire resistance. Rapid shooting, like a water pistol. Shoots a constant line of water particles. Water Particles do almost no damage to mobs/players, but push mobs back. Water Particles effectively put out fire and extinguish mobs/players that are on fire. Water Particles turn lava into obsidian, perfect for making pathways on lava oceans in the nether. Water Particles do 4 hearts of damage every half-second to blazes. Air Particles Send mobs/players flying away into the air. Air Particles do no direct damage, but can cause fall damage. Air Particles can be useful for quickly betting rid of mobs/players. 75% chance of shooting Dirt Blocks, 25% chance of shooting Saplings. Dirt Blocks do 7.5 hearts of damage. Dirt Blocks are placed when they land on the ground. Saplings do 10 hearts of damage. Saplings will grow into trees if they land on the right type of ground. Unless you’re on creative mode, you need ammunition to fire your guns. This ammunition comes in the form a canister, which you can craft with different ingredients for each gun. When you have a gun and its canister in you inventory, the icon of the gun will appear to have a canister mounted on top of it. Each canister has a certain amount of shots, and the more you shoot with the gun, the emptier the canister will appear to get. To see exactly how many shots you have left, you can either check the canister’s tooltip, or look in the top left hand corner of the screen while holding a gun, where it will show you the exact number of shots and percentage remaining. When you use up the whole canister, it becomes an Empty Canister.